CAT Vegetarian Cafe at Centre For Alternative Technology01654 705950work CafeTreat yourself at CAT with a delicious meal, baked treats, barista coffee and a wide selection of hot and cold beverages at CAT's vegetarian café. 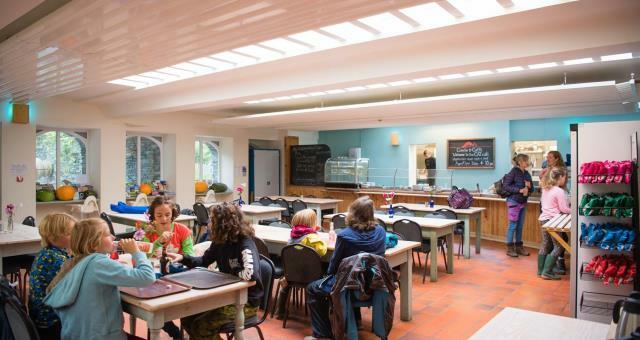 The restaurant sources local, organic and Fair Trade produce to offer appetising vegetarian dishes, light snacks and delicious home-made cakes. Here you can regularly savour fresh salad grown in CAT's own smallholding. There are also a selection of organic wines, beers and soft drinks for you to enjoy. Restaurant Opening Hours: every day in the summer holidays from 10am to 4:30pm serving hot food from 12pm-3pm and drinks and snacks all day. 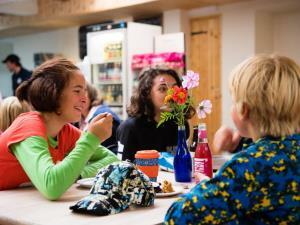 There are picnic tables around the site where you can enjoy food made at the Centre or your own packed lunch. Treat yourself at CAT with a delicious meal, baked treats, barista coffee and a wide selection of hot and cold beverages at CAT's vegetarian café. Snacks and drinks are also available in the shop and, at peak times, from the refreshment kiosk close to the cliff-railway. The restaurant is open every day in the summer holidays from 10am to 4:30pm serving hot food from 12pm-3pm and drinks and snacks all day.